The Grip Weeds "How I Won The War"
will be released on April 7th via Jem Recordings. The Grip Weeds devised an album that delivered on the promise of the lackluster film's lofty title. 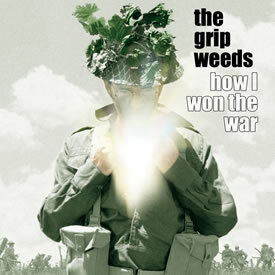 In truth, How I Won The War, the sixth Grip Weeds studio album of new material, features more emotional depth and a greater plot than the film of the same name. Like any great piece of art, the themes explored by The Grip Weeds in this 'concept' album are universal, yet there is plenty of room for the listener to insert themselves into the proceedings. Featuring vocal harmonies that would make CSNY jealous and muscular musicality on par with The Who, How I Won The War is the edgiest Grip Weeds album to date. There is no shortage of visceral stompers ("Rise Up", "Follow Me Blind"), but How I Won The War is no one trick pony. "Other Side Of Your Heart" is an acoustic-driven slice of modern psychedelia that early-era Pink Floyd fans are sure to enjoy. "Life Saver" is pure power pop with an introspective bent, while "Rainbow Quartz" and "Over And Over" take wistful looks back to budding relationships and salad days. The pounding groove of "Force Of Nature" alone will remind Mods young and old what attracted them to rock and roll in the first place. Fittingly, the album closes with a stomping yet trance-y take on The Beatles' "The Inner Light". How I Won The War, like all their previous releases, was recorded and produced by the band in their New Jersey studio House Of Vibes. Rock legends Mark Lindsay and The Smithereens have also recently graced the steps of HOV along with World Music crossover artists Ladysmyth Black Mambazo. Captain Beefheart collaborator Gary Lucas recorded an album with Robert Plant/Jimmy Page vocalist Najma Akhtar at the studio that charted internationally and received rave reviews in Rolling Stone and Mojo. "Working with these esteemed artists in a production and engineering capacity only broadens the possibilities of what we can do with The Grip Weeds," said vocalist/ drummer Kurt Reil. 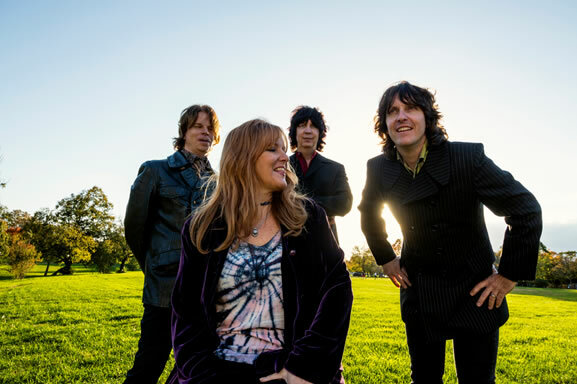 With their music having been featured on the CBS drama Criminal Minds and Little Steven's Underground Garage Radio Network, the Grip Weeds have been attracting fans from all over the world. In concert, The Grip Weeds have also performed alongside Brian Wilson, Robyn Hitchcock and members of Creedence Clearwater Revival. The past few years have been busy for The Grip Weeds. After releasing their magnum opus double album Strange Change Machine in 2010, a holiday album Under The Influence Of Christmas in 2011, concert set Speed Of Live and companion DVD Live Vibes in 2012 and rarities collection Inner Grooves in 2013, the band found themselves at a crossroads. "All bands go through their rough periods and The Grip Weeds are no exception," said lead guitarist Kristin Pinell. "Being in a band with my husband and brother-in-law is a double-edged sword. The familial bond helps us endure some situations that usually kill other bands off. Conversely, it's tougher to leave arguments in the studio when your bandmates are also your family." The tensions within the band on a personal level triggered the ideas explored musically on How I Won The War. "Our new bassist Dave DeSantis really pulled us to another level," said vocalist/ guitarist Rick Reil. "Kurt and I were at each other's throats during the early stages of this album, but Dave's musicality and easy demeanor inspired us to get down to what's really important to us- our music." How I Won The War will be available on CD, standard and high resolution digital download and vinyl from Amazon.com, iTunes, major digital download destinations and music outlets via MVD Distribution. "From the quiet to the crash and bang, this is a career high achievement that sizzles explosively." "That once-in-a-lifetime everything-comes-together kind of album; while the songs differ, there's a stylistic and thematic unity that thread each track into one cohesive unit." "By far one of their best efforts and most diverse undertakings to date!"